Here’s a look at what you might have missed this past week. After two years as the Parx Casino Philly Cycling Classic, the iconic bike race that has zoomed through Northwest Philadelphia for 30 years has again been renamed and reclaimed. Check out the full story. Germantown United CDC closed out 2014 with a very successful fundraising campaign, but 2015 isn’t offering any time to relax. By the beginning of February, the young CDC already has several new initiatives underway and is promising big impact across the neighborhood’s creative, historic, development and business sectors. Here’s the full story. “Wissahickon: A Photographic Journal,” which opened at Woodmere last month, features 24 breathtaking photographs of the Wissahickon captured by 10 local photography students and enthusiasts. Here’s the full story. Last weekend Philadelphia University basketball coach Herb Magee won his 1,000th game as head coach at Philadelphia University — a feat that only one other coach has ever reached in NCAA men’s basketball history. Here’s the full story. 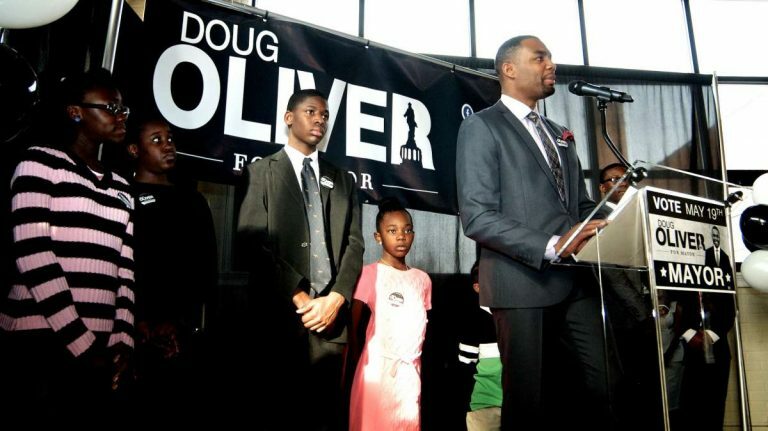 Doug Oliver once reported to City Hall as Mayor Nutter’s press secretary. After a stint with the Philadelphia Gas Works, he now hopes to return there to lead the city himself. Saturday afternoon, Oliver, 40, made his mayoral bid official before dozens of smiling family and friends. Here’s the full story.